Here are the results from our fourth month's App Teams survey and poll, for January, 2016, which was all about app tools. 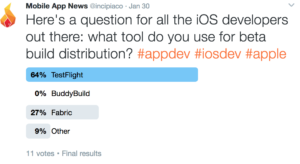 Twitter Poll – What beta build distribution tool do you use? While Android APKs can be distributed quite easily (even sent via email or downloaded from the Google Play Store via beta listings), iOS beta apps must be distributed through a service, with the primary service being Apple's TestFlight (an Apple acquisition) beta distribution service. TestFlight works fine as a testing platform and comes with a few useful features such as providing tester installation state/timestamp, yet it does require testers to download the TestFlight app in order to download apps for testing. Perhaps the biggest pro and con of TestFlight is that it is owned by Apple, and as such apps must be approved by Apple in order to test, which is a pain for the testing process, but also gives you a nice confidence boost that your app is following guidelines and likely to be approved in final submission. Additionally, TestFlight allows for a far more greater number of testers than Fabric or BuddyBuild (up to 2,000 through TestFlight). The appeal of Fabric (a product expansion of the Crashlytics crash reporting tool) was that it offered more bells and whistles than TestFlight, naturally included the amazing Crashlytics SDK and also did not require users to have to download an app just to download your beta app for testing; the downside was the very tedious process of adding new beta testers and a limited total number of testers. BuddyBuild was our favorite for some time, namely for its tools, integration with Crashlytics and above all else for its magical ability to not only allow users to download an app from an email, but also to take care of the tedious user provisioning mentioned as Fabric's downside. While it began as a fully free product, BuddyBuild recently transitioned to freemium model, affecting things that an app development shop cares about, like build queues and concurrent builds; additionally, it is subject to a smaller limit on the total number of testers, like Fabric. Shockingly given the magicalness of BuddyBuild (the only beta distribution tool in our 30 Must-Use Tools for App Startups list), no respondents indicated that they used BuddyBuild (though we only had 11 replies). 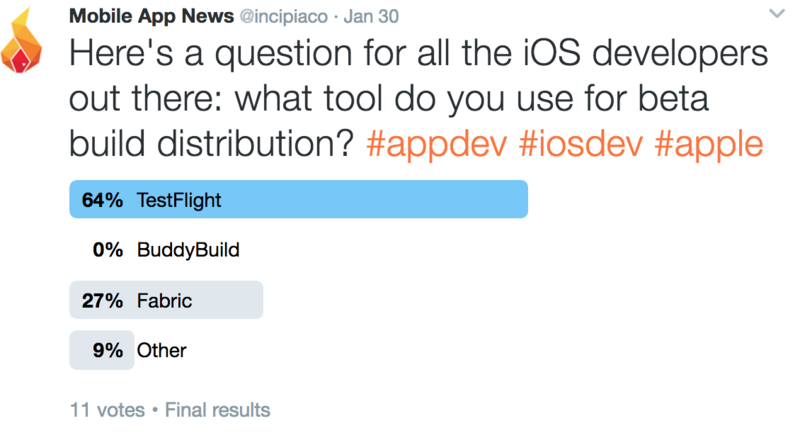 The majority stuck with TestFlight and several indicated they used Fabric and one or more other providers. Another notable beta distribution tool that was omitted was Hockeyapp (acquired by Microsoft). As noted thrice above within parentheses, these beta distribution tools have been snapped up, one after the other by the software OS companies, leaving the lone independent ranger, BuddyBuild going stag. While the OS owners all have made their beta distribution purchases, time will tell whether another technology company may decide to make a bid for BuddyBuild. App Teams Survey Question #1 – What primary attribution tool do you use to see where users are installing your app from? 15.6% of respondents not using an attribution tool of any kind, not even the free attribution tool, Branch. It's possible that this is because the basic attribution (source reporting for iOS/Android and campaign link generation for iOS) is sufficient for app teams who are not running paid or major marketing efforts. The equal-footing of Kochava vs Adjust, AppsFlyer and Tune, who lately have been making app marketing headlines by promoting feature additions, raising new funding and publishing boatloads of studies (whereas we haven't heard a peep from or regarding Kochava). The dearth of Branch users, again given that it is a free tool (though Branch is not an MMP of Facebook or other popular ad platforms; on the subject, Tune somewhat recently lost its Facebook MMP status). The number of "other" attribution tool replies (however there was some difficulty encountered whereby respondents didn't see one or more vendors that were listed, and selected "other" instead). App Teams Survey Question #2 – What primary analytics tool do you use to see what user behavior is like inside your app? The 64 respondents to this question were also fairly divided, but for analytics there was a more clear winner, which was none other than the king of web analytics: Google Analytics. This is not surprising, given Google Analytics is a free tool and an interface familiar to most people who have managed analytics for a webste. The number of respondents who did not use any tool dropped from 15.6% to 6.3% when comparing attribution to analytics tools, which can be understood from the idea that, if teams don't invest as heavily in marketing, their resources will be focused on product, and to build and grow a great product requires deep product insight. Tune made another solid showing, tying for #4 with Amplutide. App Teams Survey Question #3 – What primary engagement tool do you use to get users to use your app more? From the votes of 63 respondents, the largest single response of any of the January 2017 survey was produced (not using any engagement tool); however, worth noting was that I don't use a tool did not receive a full majority of all responses. This is a problem. Failing to implement an engagement strategy is a major gaffe by any serious app team, as highlighted in our interview with Grow.co co-founder Adam Lovallo, who spoke specifically to the marketing members of app teams. But, even teams without a dedicated marketing focus would do themselves well to understand the importance of (or conversely the opportunity cost of not) investing effort into user retention. Using an engagement platform is crucial to preventing your bucket (i.e. app) from leaking (i.e. failing to retain its users). There's really no justifiable excuse for not setting up an engagement platform, especially given that there are free options such as OneSignal. Regarding actual tools, Appboy(a moderately priced, solid engagement platform) led the pack with more than double votes of next contender. Localytics (which purports to be both an analytics and engagement tool) picked up 2 votes from analytics respondents, moving from 4.7% for analytics tools to 7.9% for engagement tools, and beating out the venerable Urban Airship. Interestingly enough, regularly-mentioned Lean Plum and Swrve were upstaged by an upstart push platform (OneSignal). The recently released Amazon Pinpoint scored the only 0% response rate of this question. We have heard little of the tool since its announcement, meaning that either the industry needs more time to get on board with it, or the tool just isn't that good and perhaps Amazon over-extended itself. Examining a Google news search, only one article was found dated beyond the launch month of December, 2016. This article referenced a driving app called Mileup that uses Pinpoint, whose website has broken App/Play Store links, a 2 star iOS rating and a 3.8 star Android rating with 100-500k downloads. Perhaps the latter, then. App Teams Survey Question #4 – What primary ASO tool do you use to get more insight into your organic performance? Saving the best for last, we asked our 64 respondents to tell us what their favorite ASO tool was, and were honestly a little intrigued to see that most indicated their preference for Priori Data, whose ASO toolset has only just recently begun to provide functionality provided for far longer by the other ASO tools. Though we do have to say that Priori's setup of unlocking apps and hyper-modularized pricing is pretty attractive, and after talking with their founder, their data estimation assumptions are based on sound logic. While there are numerous ASO tools and several were not listed here (e.g. Searchman, The Tool, AppFigures, etc. ), the "other" response in this question registered the fewest responses than any other question. App Annie's position resembles that of in-app purchases in a way: acquire a massive net of potential paying customers by giving away a very wide array of shallow, yet useful features for free, and then charge anyone who wants premium features (an arm and a leg in App Annie's case). Again, a solid showing for Tune, which captured 4th place. Surprisingly, though, our two current favorite tools, Mobile Action and AppTweak both registered at the bottom end of specified tools. For those of you who don't use an ASO tool - please contact us and let us straighten things out for you. If you can think of a survey topic or question that you'd like to learn about next, send us an email or reach out to us on Twitter! Also, be sure to sign up to our email newsletter to receive the monthly App Teams Survey.